3 Bedroom Flat For Sale in Falmouth for £495,000. Commanding stunning views over Maenporth Beach and Cove this stunning apartment offers superb open plan accommodation complete with roof terrace from which to enjoy the wonderful vista on offer. Maenporth is an extremely sought after hamlet and is located approximately four miles from the colourful harbour side town of Falmouth which provides a wide range of business and leisure facilities. The apartment is located within the sought after and renowned Maenporth development, above Maenporth beach and is set amongst beautifully landscaped gardens and grounds as well as woodland (approximately 29 acres). On site facilities include a leisure centre with full sized heated indoor swimming pool, table tennis area and games room. There are also tennis courts and a highly regarded restaurant is situated at the entrance to the development, as well as a beach cafe which is located on the actual beach itself for daytime snacks. 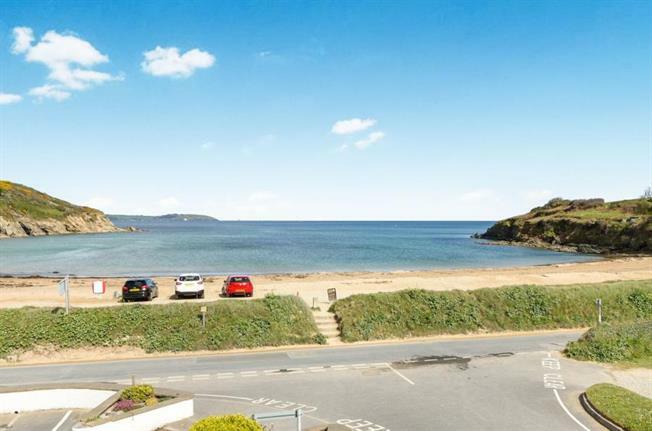 This superb apartment is situated in arguably one of the best locations at maenporth being at the Cove, close to the entrance and commanding stunning views directly over the beach. Superb open plan room with a fantastic feel of light and space. This stylish modern kitchen is fitted with a range of base and eye level units with a granite work top over and inset sink and drainer with mixer tap in tiled surround. There is an integrated electric oven, hob and extractor fan, integrated dishwasher and fridge/freezer. There are double doors leading out to the roof terrace and enjoying a stunning open view of Maenporth beach and the sea beyond. Radiator and superb views again out over Maenporth beach. Fitted with a fully tiled shower cubicle, pedestal wash hand basin, close coupled WC, fully tiled surround, heated towel rail and extractor fan. Fitted with a modern white suite comprising a panel bath with mixer tap and shower attachment, pedestal wash hand basin, close coupled WC, bidet, obscure glazed window to the rear aspect, heated towel rail and extractor fan. To the front of the property is a balcony/roof terrace enjoying a superb outlook directly onto Maenporth beach and cove. There are two allocated parking spaces with this property.